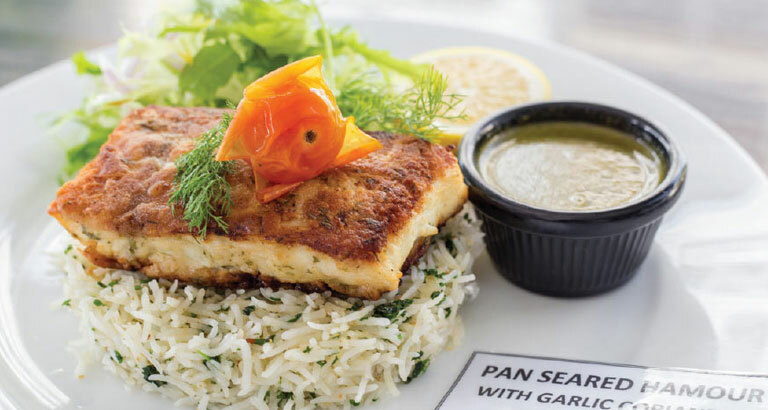 This popular restaurant’s newest branch in Amwaj features well-loved Indian gastronomy with an extensive assortment of international fare. Lanterns has opened a standalone gourmet lounge at Amwaj Islands, consisting of a dining room and bar fitted with sleek, modern fixtures. The menu showcases Indian specialities as well as burgers, pasta, pizza and light bites. Start your morning with a hearty breakfast, and choose from eggs made to your liking, paired with basil pesto, avocado or beef bacon. Alternatively, delight your sweet tooth with banana pecan French toast or coconut porridge. Health-conscious individuals can opt for the super food salad with quinoa and sunflower seeds, the classic Caesar or the burrata and pesto salad. Main courses include the famed Wagyu burger, grilled hammour, piri-piri chicken, cottage pie and curried tiger prawns, to name a few. For a quick snack, nibble on onion bhaji, edamame with rock salt, salmon croquettes, calamari, bruschetta or fish fingers. A special tandoori section with sumptuous meat, poultry, seafood and vegetarian options can be sampled. A plethora of tantalising curries like the chicken tikka masala, paneer kadhai and dal makhani can be had along with aromatic, spicy biryanis of all kinds. The famous Friday brunch will be introduced later this year. An outdoor garden lounge is set to open soon for diners to enjoy the good weather.